This 3050 sq. 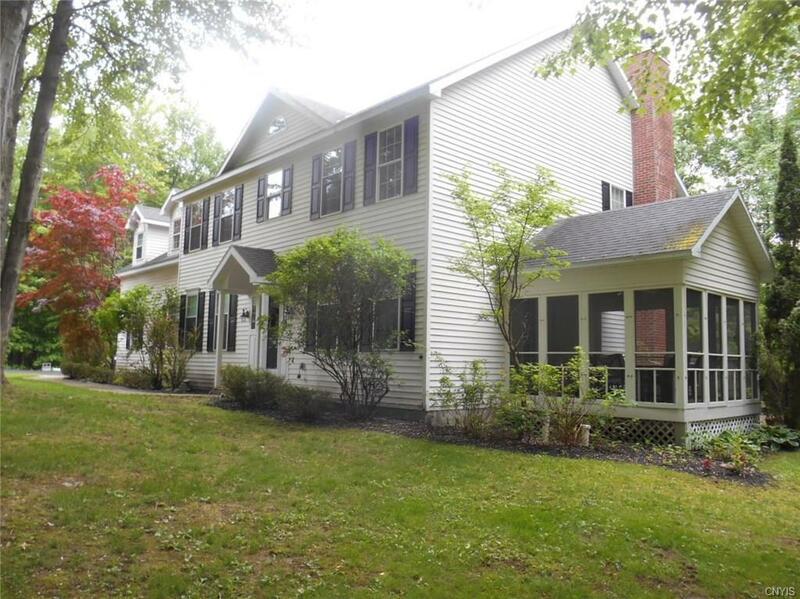 ft. Classic New England Colonial, on 1.87 acres, offers privacy, a picturesque wooded setting & charming pond! Welcoming Foyer opens to Formal Dinm, white judge's raised panel wall accents, French Doors w/transom window to Livrm or Office; hardwoods accent fabulous Great Room, chef's Kitchen w/pantry, granite counters, breakfast bar, spacious Famrm w/wood-burn Fireplace flanked by built-in entertainment center; natrl light flows fr Palladian windows in Morning Rm w/entr to deck;Laundry/mudrm off the garage. 4 BR & 3 Baths up. MBR is offers gas Fireplace, sitting area, private Bath w/lg vanity, jetted tub, sep shower & walk-in closet! Partially fin basement offers a Rec Room w/exercise area, half Bath (plumbed in for a showr) & workshop space. GFA & Central A/C.